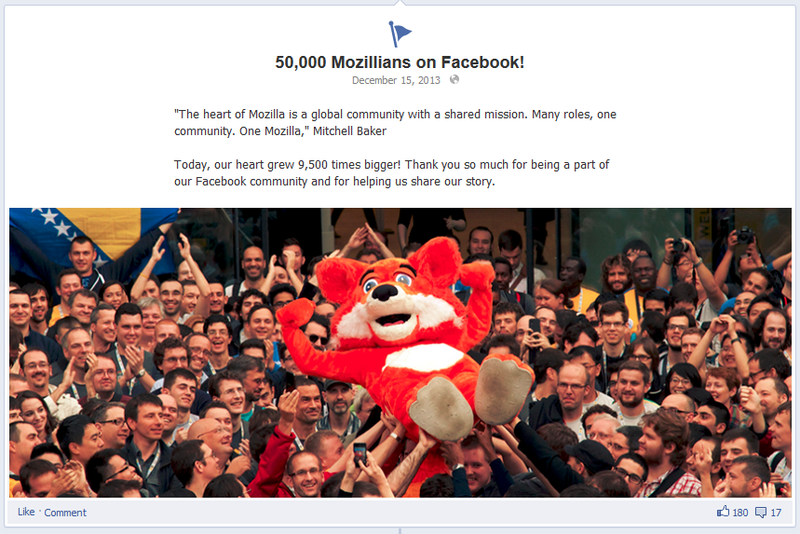 Mozilla’s Facebook audience is multilingual & globally diverse – even at the outset when we had only 303 followers. Contribution on-ramps, peer-to-peer celebration, clear explanations of our new initiatives, and telling the world about our history and mission were my primary goals. My secondary goal was to make our Product Support channels more visible, and to answer as many messages with relevant links into the Support systems as possible. People who came looking for technical solutions, became people who liked our stories and shared our messages. 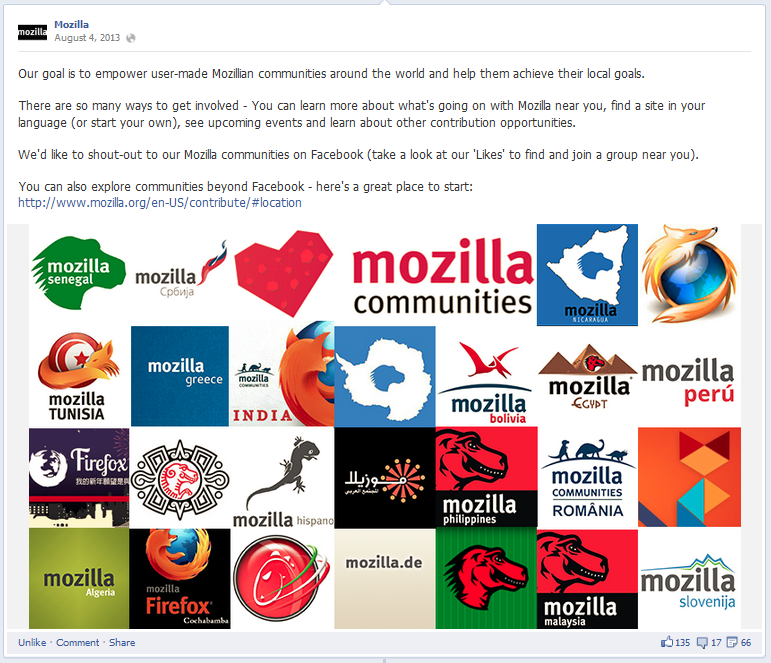 On Facebook I found active Mozillian voices in communities as diverse as Thailand, Ireland, and Romania, and also many ‘tech-curious’ individuals across the globe. I listened to the community and learned to create stories and content that celebrated their interests, as well as showing how our work impacted them in multiple ways. There were many strategic concerns – ranging from using a simpler writing style, with simpler phrasing, word choices and less technical jargon (because until the channel content could be fully translated and localized, most messaging would default through Facebook’s comment translation tools) to ensuring I kept up to date with multiple platform changes (which both offered me greater control in geo-targeted messaging, but also constantly complicated metrics analysis with every update). 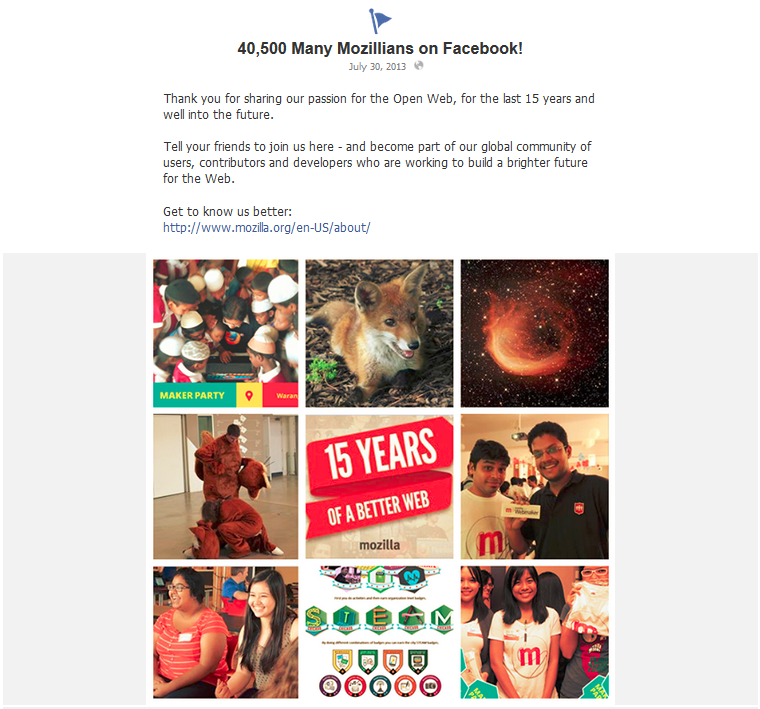 Building community, attracting discussion and opportunities for learning and educating abounds on Facebook. I believe it is the social medium that is most honestly reflective of personal values and shared affinities, and by focusing on content that united all followers together, Facebook became my most successful engagement platform and the one I’m most proud of. 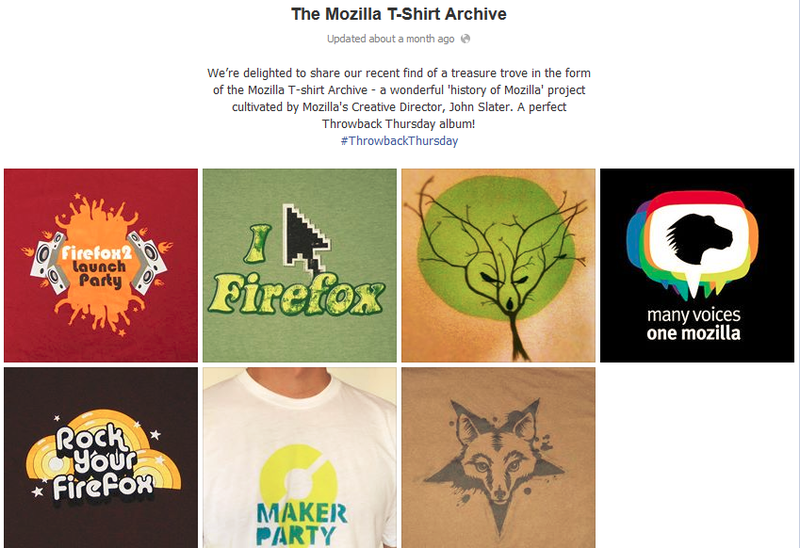 to encourage followers to participate in Events and global awareness campaigns.